The radius contributes to about 180, the humerus 120, the clavicle 40 and changes in the position of the thorax to about 20 degree to the total rotation of nearly 360 degree of the arm (as reflected by the position of the palm of the hand). Figures 2 to 5: The white mark points to the olecranon (the proximal end of the ulna and connection of the triceps). The yellow mark points to the distal end of the ulna. Fig. 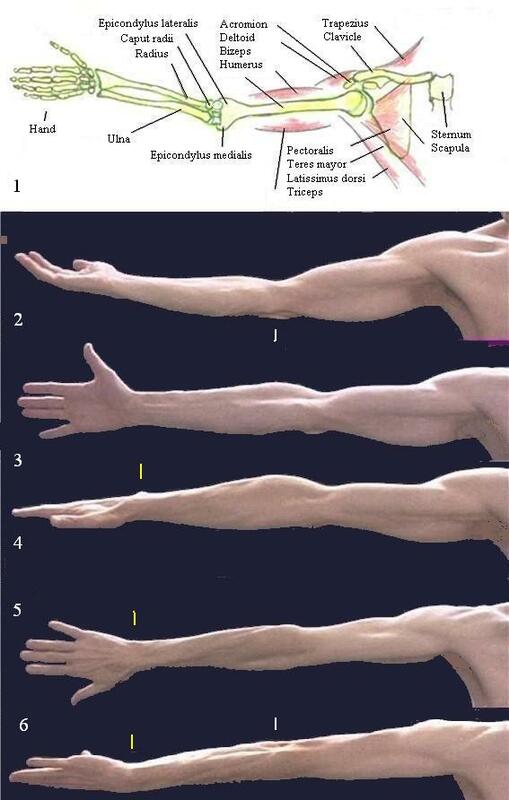 2: The palm of the hand turned up: The olecranon presents down, biceps up, triceps down. Fig. 3: Frontal view onto the hand: The radial side of the fore-arm and the thumb present up, the ulnar side and the little finger down. Fig. 4: The palm of the hand turned downwards: The thumb moves to the front, the little finger to the back. Fig. 5: The palm of the hand turned backwards: The radius crosses in front of the ulna. The distal end of the ulna presents as a dark spot. Fig. 6: Final rotation involving mostly humerus, clavicle and thorax. Triceps and olecranon present up, biceps down. The distal end of the ulna is visible as a bright spot.